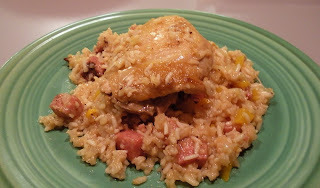 Spicy Chicken and Rice - Another Quick Recipe to Make Before the Big Day! So much is going on, wrapping last minute presents, finishing up your big menu, and worst case scenario, you are still shopping! Well this meal is a quick, one-pan, dish that your family will love. This dish has some kick, so if you don’t like a lot of spice, reduce the amount of cayenne pepper. This is a dish that is better the next day. One other note, you can use green, red or yellow peppers for this recipe. I used yellow peppers; they were on sale. Cut chicken in legs, thighs, breasts leaving meat on bone (or you can buy it already cut up. Saute chicken and ham in extra-virgin olive oil over medium-high heat for 5 minutes on each side and remove from pan. Make sure you get a nice golden crispy skin, this will seal the juices in the meat. In same pan, saute pepper, onion and garlic 5 minutes over medium heat. Add seasonings and broth and simmer for 10 minutes. Fluff rice with fork and cook 5 minutes longer. Appetizers for New Years Eve! The big night is coming; do you have your menu set? As promised, here are a few more appetizers to go along with the ones in my post titled Lisa Entertains Allergen Free: Appetizers to Serve at Your Next Party. Today’s recipes are simple and easy, you can prpare them in advance (except the Brown Sugar Bacon Bites) to help keep you out of the kitchen all night. 2009 is going to be very exciting; I have some very special events and giveaways planned for you. Make sure to sign up to follow my blog to keep up to date. Mix all ingredients together and grab some tortilla chips. 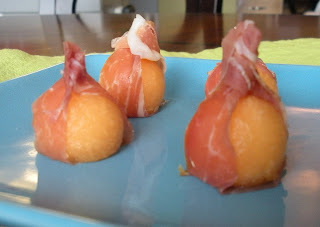 Wrap prosciutto around melon and secure with tooth pick or you can make melon balls and wrap prosciutto around melon like a present (see picture). Place cooling rack over aluminum foil on baking sheet. Mix maple syrup and dried mustard in a bowl. Cut bacon into bite sized pieces and generously place brown sugar mixture on one side of bacon. 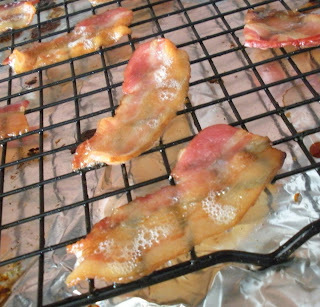 Place bacon strips on cooling rack in a single layer, brown sugar side up, it will take you a few sheets to complete the whole pound of bacon. If you are sensitive to sugar, maple syrup is a yummy alternative. Looking for a great bread mix to make at home? Anna really hits the mark with her unique mix of breads. Nine out of ten of her mixes are gluten, corn, dairy, soy, rice and nut free. All Breads From Anna® mixes are high in protein and fiber and only sweetened with maple or honey, no refined sugars. The ingredients used are all-natural, free of any additives or flavor enhancers. Most importantly, the taste of Anna’s breads is great, my personal favorite is her banana bread, you’d never know the difference between it and any variety filled with allergens! Q. Do you have food allergies? Anna is celiac and allergic to soy, dairy and corn. She also is Type I Diabetic. Q. How many attempts have you taken at your recipes to make them just right? Q. How long do your products last once you make them? Q. What new products do you have coming up? Anna is introducing a new line of pancake and muffin mixes! Look for 3 varieties, apple, cranberry and maple. Q. What do you do to ensure no cross-contamination in your products? All Breads From Anna® mixes are packaged in a gluten-free and nut-free facility and all ingredients are sourced from gluten-free vendors. Q. What are your favorite products you make? Regular sandwich bread and pie crust. Check out Breads by Anna, a great addition to your family’s diet. Most recipes require eggs, but you can easily use an egg replacer. You can buy Anna’s Breads thru her website http://www.glutenevolution.com/ but she recommends buying it in the store for better pricing. Store locations along with a form you can bring to your favorite store (if you would like them to carry Breads by Anna) are found on her site. 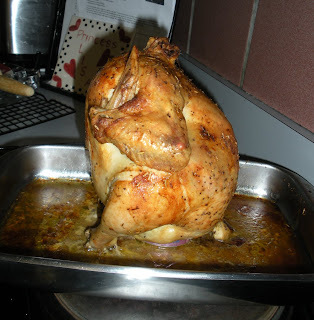 Beer Can Chicken (minus the beer)! Beer can chicken is a great way to make the chicken nice and juicy. Of course, those of us with allergies can’t use a beer, so let’s get creative and use another can and fill it with your favorite spices and liquid, have fun with it, try my recipe and the next time add any other spices your family likes. Enjoy! Add seasonings to can along with liquid mixture, reserve some spices to rub into the skin of the chicken. Place chicken in oven and cook for 90 minutes or until internal temperature in the thigh reaches 165°F. 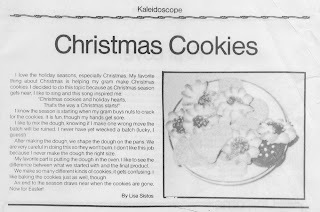 I was going thru some old papers and I found this story I wrote for my school newspaper, appropriate for today’s post, eh? 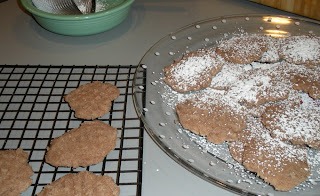 Well, making these cookies were challenging, no butter, no egg, no wheat, but the end result should be quite pleasing. I encourage you to modify the recipes to include foods that are safe for your family; all my recipes are free of the 8 major allergens plus gluten. The cookies are VERY delicate until they are cooled, so be very careful when handling them. Enjoy! P.S. I used white frosting for my sugar cookies, you can color your frosting with these natural colors or use food dye. Beet juice or powder for purple. Combine flour, Kosher salt and cinnamon together by sifting and set aside. In a separate bowl, mix together water, canola oil and baking powder. Blend sugar and shortening together and mix together with baking powder mixture. Fully blend in the flour mixture, adding small amounts at a time. Make 1” balls and place on an ungreased cookie sheet. Use a fork to push down cookies (cross-hatching them looks good). Bake for 9 minutes and put on a rack to cool. The cookies are very delicate until they are fully cooled, be careful! Combine oil, shortening, apple sauce and sugar until smooth. In a separate bowl, combine egg replacer and water and stir until fluffy, add to sugar mixture with vanilla and rice milk. 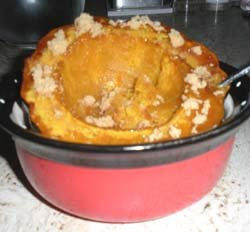 In a separate bowl, combine flour, xantham gum, baking powder and Kosher salt. Gradually add flour mix to sugar mixture until well combined. On a clean dry surface, sprinkle rice flour and roll ½ of dough out to 1/4” thickness. Sprinkle flour on your rolling pin to keep dough from sticking. Be very careful when cutting shapes as this dough is very fragile until it is cooked and cooled. Put cut out cookies on an ungreased cookie sheet and bake for 6-7 minutes. Blend together powdered sugar and vegetable shortening. Add rice milk and vanilla and mix until smooth. It is so hard to feel safe when you go out to eat and have to trust your safety in the hands of strangers. Try using these tips to make your dining experience more safe and enjoyable. If you don’t want to go out, enjoy some brisket with grilled asparagus! Tell everyone about your allergies; download our food allergy restaurant safety sheet to give to your waiter to take back with your order. The more people that know in the restaurant the better. You may even want to call in advance and let the manager know you are coming. He can give you an idea of what foods are safe and what practices are used to avoid cross-contamination. Don’t feel intimidated asking the waiters about the menu, if they don’t know, ask them to go to the kitchen and ask. If they are resistant, you might want to consider another restaurant or contact the manager. Your families safety is worth it! Now some recipes for those of you that like to stay home… Enjoy! In a large deep skillet or pot over medium-high heat, add extra-virgin olive oil. Season brisket generously with ground black pepper. Place brisket in the pan and cook until the surface is a rich brown color, not burnt, but dark and flip to brown other side. Lift the brisket and scatter the onions in the bottom of the pan. Place the brisket, fat side up, on the onions. Saute for 2 minutes, or until onions are browned. Add the garlic to the pan, and fill with enough water to almost cover the roast (about 2/3 way full). Bring to a simmer and cover with a lid or tight-fitting aluminum foil. Simmer for 4 hours, turning the roast over once halfway through, the roast should be fork tender. Remove the brisket to a serving platter. Bring the broth in the pan to a simmer, scraping the bottom to loosen any browned bits. Cook until reduced to a thin gravy. Taste and season with Kosher salt and ground black pepper if needed. Trim ends off asparagus and discard. In a skillet on medium-high heat, add extra-virgin olive oil and onions to pan and sauté 2 minutes. Add asparagus, Kosher salt and ground black pepper, cook to desired doneness, about 5-8 minutes. The holiday shopping season is among us and this tasty chicken and rice dish hits the spot after a long day at the mall! Lay rice in bottom of large casserole dish, add chicken stock. Heat extra-virgin olive oil in a saute pan and sear chicken on each side to seal in juices. 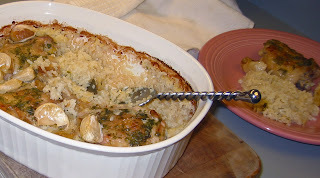 Add chicken and garlic over rice in casserole dish. Mix white wine, Italian flat leaf parsley, tarragon and Kosher salt in a separate bowl and pour over chicken. Cover casserole dish and bake 1½ hours – don’t peek. You have enough Thanksgiving food in your refrigerator to feed a football team, but you still need to feed your family dinner, how about a kid favorite - sloppy joes! Just grab your favorite allergen free bread and if you have some extra potatoes, try my herb roasted potatoes as a side (see Lisa Shops Allergen Free at Rose's Bakery and Hamburgers with Roasted Potatoes). 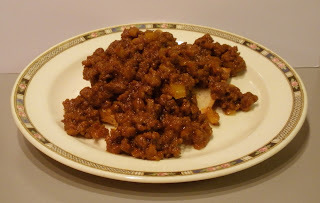 Kids love these sloppy joes and they are so easy to make. You can use any color peppers you have on hand, yellow peppers were on sale when I made these. 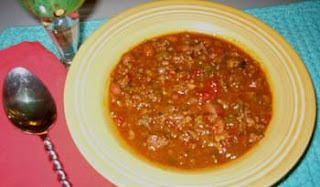 In a skillet over medium heat, brown the ground beef, onion, and green pepper; drain off liquids. Stir in the garlic powder, mustard, ketchup, and honey; mix thoroughly. Chicago is where I call home and we finally got the weather we have all been dreading. COLD! Nothing helps take the chill away like nice hot soup. There is this great little place in Chicago that serves nothing but soup and fresh bread; I really missed their cream soups after I was diagnosed with dairy allergies. 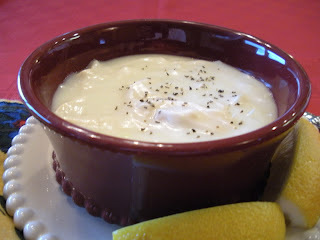 So, I played around a little and think you will be pleased with the results of the first recipe, its a little time intensive, but a winner if you like cream of chicken soup. 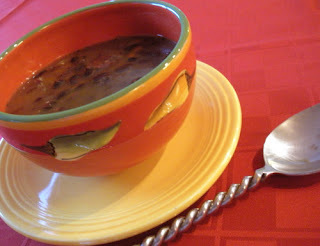 The second soup, a black bean soup, is a family favorite, my brother Jeff drives 1 hour out of his way to pick up some soup to take home when I make it. You may have a hard time finding a ham bone; you can substitute with pieces of ham added the last hour of cooking. The lemon in this soup really brings out the flavors. You can have it with the shredded chicken or without, either way, YUM! Cover chicken with water and bring to a boil. Turn down flame and simmer chicken for 5-7 minutes or until center of breast is white. Strain chicken and set aside to cool. Once cool, shred chicken between your fingers. Boil rice and celery until tender, drain and run through sieve or blend on high. Combine rice and celery mush with chicken stock, lemon juice and rice milk. If you don’t have a sieve, blend rice and liquid mixture in a blender in small batches until smooth. Add shredded chicken breast to soup. Season to taste and serve with lemon slices and chives on top. A nice hearty soup to warm up after a cold day. Add your favorite hot sauce for a little kick! 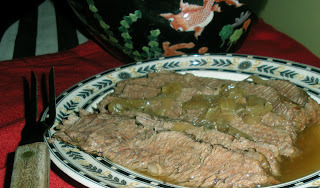 In a saute pan over medium high heat, brown beef cubes on all sides and set aside. Drain beans and add to 3 quarts of water to a large stockpot. Add ham bone, beef, celery leaves, carrot, onions, thyme, sage, mace, cloves and cayenne pepper and bring to boil. Simmer several hours until beans are tender. Remove meat and bones and mash beans and vegetables. Return mashed mixture back to pot. Bring pot to a boil and stir well, add slivers of ham cut from the bone. I just can't believe another year has passed, the one year anniversary of my food allergy diagnosis is this week. It's amazing how much my life has changed in one year. Who would ever think food would make you sick? My diagnosis was a blessing for me, my allergies had affected me for so long, I just assumed everyone felt bad all the time like I did. I am hoping as time goes on, more and more doctors consider food allergies when their patients have the symptoms. The good news is the word is getting out there, look for more information from this site, it will be growing very soon (Jan 2009). With that said, let's party! Appetizers are so fun, I will make some more fancy appetizers closer to New Years Eve, enjoy! Need I say more? 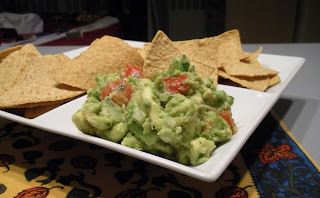 Guacamole is everyone's favorite, you can be loose with this recipe and add ingredients to taste using this recipe as a starting point, it is all good! 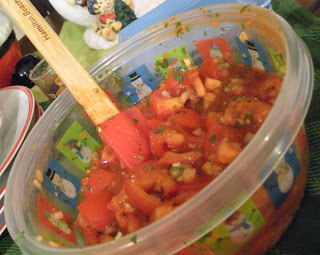 Mix tomato, onion, cilantro, garlic, lime juice, Kosher salt and ground black pepper in a mixing bowl. Mash avocados in serving bowl and add other ingredients, mix well. Sweet and tangy, cooking these wings really stink up your house from the oil, perfect for watching the game! In a large bowl, mix together the honey, lime juice, lime peel, garlic, Kosher salt and ground black pepper. Place the flour in a plastic bag and shake the chicken wings in the flour to coat, shake off excess flour. 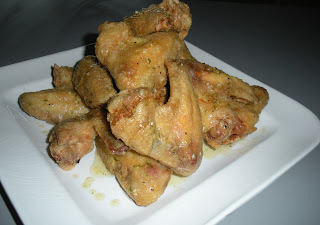 In a deep stock pot, fry the chicken wings in a single-layer in hot canola oil until cooked through. Place the cooked wings in the honey/lime mixture and toss to coat well. Serve immediately. 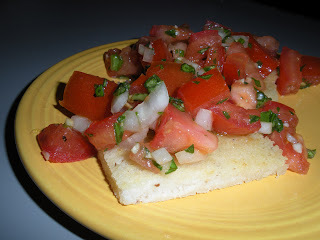 I loved the Bruschetta they used to serve at the Willowbrook Ballroom in Willow Springs, when I worked there as a kid, although there is no cheese and the bread is wheat, gluten and dairy free, it is just as yummy, enjoy! Making a turkey with food allergies is no problem, it's the sides that are so difficult, especially when you exclude all 8 allergens plus gluten. Now bear in mind if there is something you can have, for example soy, I would replace the applesauce and chicken stock in the mashed potatoes with Smart Balance, but if you can't have soy, our mashed potatoes are pretty creamy and smooth. It seems adding in things is way easier than taking them out, so have fun with it and don't forget to give thanks. Bring water and sugar to a boil in a small sauce pan until sugar is fully dissolved. 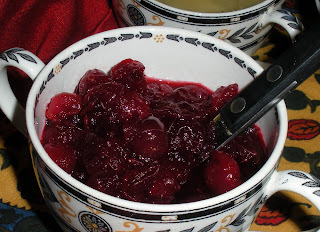 Add cranberries to pan and reduce heat to simmer, stirring occasionally, until berries pop. Add lemon zest, stir in and cool. These rolls turned out pretty good, they are not as dense as others I have tried. They are a little gooey, but really yummy when dipped in vegetable gravy. Combine all ingredients, egg replacer should go in last as it needs to be mixed immediately. The dough is gooey, add water if it sticks too much. Use a 1/4 cup measure to scoop dough into balls of uniform size and place in greased cupcake pans. Fill large stock pot with water and put on medium-high flame to boil. Add whole potatoes to water and boil until potatoes are tender, about 20 minutes. 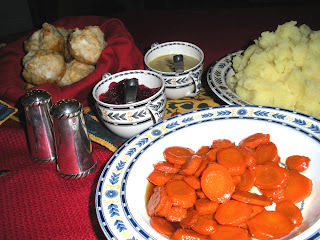 Add remaining ingredients and mash, don't over mash as the potatoes will get too pasty. This gravy is great if you need to make it ahead of time, of course, you can always add turkey if you are making it for immediate use. Even better the next day! Heat canola oil in a medium saute pan over a medium high flame. Add carrot, celery and onion and saute until nicely browned. Stir in flour and cook, stirring constantly for about 5 minutes. Simmer gravy for 20 minutes while stirring occasionally. 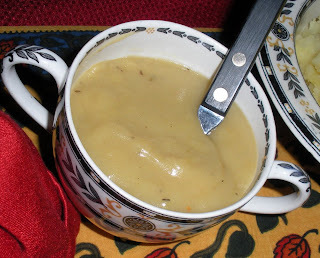 Strain vegetables and seasonings out of gravy and enjoy! I have sugar sensitivities, so I make this dish substituting honey for the brown sugar. 8 carrots, cut on a diagonal in 1/4" pieces. In a saute pan over medium heat, add canola oil, brown sugar and grated lemon rind and juice. Stir until brown sugar is fully mixed with canola oil. 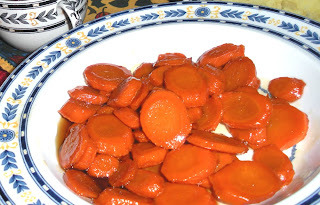 Add carrots and cook for 15 minutes (or until carrots are tender), stirring occasionally. The Chicken, Avocado and Mandarin Salad recipe below has a nice mix of taste and texture with the celery and red pepper providing crunch and the mandarin orange giving a juicy burst of sweetness. This list is only a start of the many foods you can add to salads for appetizers or main-courses. Have fun with it and try different things. I have some recipes for salads and homemade dressings for you to try; they are good starters to expand your salad horizons. Refrigerate your plates; it keeps the salad crisp and fresh. Don’t dress until you are ready to serve, the salad gets soggy. Try to use lighter dressings for delicate greens so the dressing doesn’t overpower the ingredients. When using pastas in salads, cook al dente as the pasta absorbs moisture from the vegetables and if it is cooked too long, the pasta will become mushy. Let me know what delicious combinations you discover, the options are endless. Enjoy the recipes for Sweet and Tangy Salad Dressing (tastes like French dressing), Tomato Salad - a yummy appetizer and the Chicken, Avocado and Mandarin Salad, our main-course. Combine honey, celery seed, Kosher salt, dry mustard, garlic powder, ketchup and white wine vinegar. Add canola oil slowly with an electric beater. 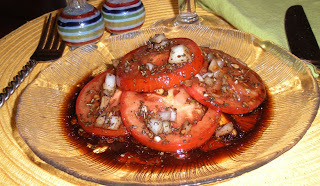 My father-in-law, Walt, loves to call dibs on this salad, best in August when fresh, local tomatoes are available. Slice tomatoes ¼ inch thick. In salad bowl, combine oil, balsamic vinegar, Kosher salt, ground black pepper, basil and garlic. Whisk the dressing until thoroughly mixed. Add tomatoes and onions and toss together gently. I love making this salad for company, everyone loves it! In a large sauté pan over medium high heat, add canola oil. Lightly season chicken with Kosher salt and ground black pepper and add to pan. Cook thoroughly on both sides until breast reaches internal temperature of 165°F or until the juices run clear, set aside to cool. Combine Italian flat leaf parsley, honey, canola oil, white wine vinegar, Kosher salt, ground pepper and garlic powder in a blender and blend for 30 seconds. Add lettuce, celery, red pepper to bowl. 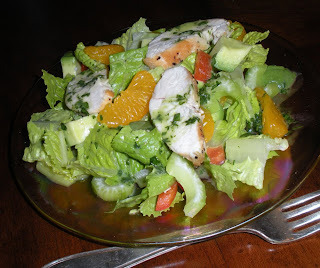 Top with Mandarin oranges, avocado and chicken breast, cut into strips. Pour dressing lightly over salad, reserve a little, mix and add remaining dressing to taste. Have you scoured the shelves at your local grocery stores and can’t find that treat for your kids or a product that is free of all the allergens your family has? Well, you are in luck because in Northbrook you will find the Gluten Free Store that has all kinds of meals, treats and condiments that accommodate almost every possible combination of food allergies. Q. What ideas do you have for kids for their lunches/snacks? It all depends on their allergies, but check out some of these brands to see if they are safe for your family. Q. What products do you wish you could find a good substitute for? Heads up readers – Kathy is working on a new product, keep your eyes out for a pop-tart like product! I can’t wait. I really like the variety of products at the Gluten Free Store; I grabbed my favorite bread mix while I was there, made by Breads From Anna, in fact my house is filled with the smell of banana bread as I write this post. The Gluten Free Store has all of the products you will find at your major grocer, but also carries unique brands from smaller manufacturers, it’s definitely worth a stop if you are headed to the northern suburbs of Chicago, if not, give Kathy a call. The Gluten Free store is located at 807 Waukegan Rd., Northbrook, IL 60062, 847-513-6515. 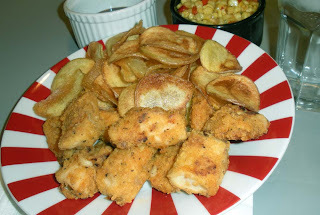 For the weekend, let’s do some kid friendly foods, like chicken nuggets and homemade potato chips. These potato chips are time intensive, but the kids really get a kick out of them, it is hard to make a full order, they seem to disappear quicker than I can make them, Enjoy! Cut chicken breasts into 1" x ½" pieces. In a medium bowl, mix together the seasoned flour, thyme and basil. Mix well. Put canola oil in a separate bowl and mix in honey. Dip chicken pieces into the canola oil and honey mixture first, then coat with the flour mixture. Place well coated chicken pieces on a lightly greased cookie sheet in a single layer, and bake in the oven for 20 minutes. Turn chicken after 10 minutes. Place potato slices into a large bowl of cold water as you slice them. Drain bowl, rinse, then refill the bowl with water, and add Kosher salt. Let the potatoes soak in salty water for at least 30 minutes. Drain bowl, rinse and drain again. Heat 1” deep of canola oil in a large stock pot over a medium high flame. Thoroughly dry potato slices and add to oil in small batches, do not stack. Once they start turning golden, remove and drain on paper towels. Continue until all of the slices are fried. Season with additional Kosher salt if desired. I chose three fall vegetables to look at a little further, winter squash (including acorn, spaghetti and butternut squash), sweet potatoes and parsnips. Winter squash, including spaghetti, acorn and butternut squash, is an excellent source of vitamin A & C, potassium and fiber, and a good source of folate and thiamin. 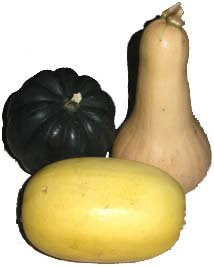 When looking for a good squash, the skin should be thick and hard without any marks and heavy for its size. A great thing about squash is that you can store it for a month or more in a cool, dry place. Squash gets a bad wrap at being hard to cook, but really it is quite easy. • Halve, remove seeds, put small puncture marks on the outside skin and poke a fork into the inside meat and sprinkle with salt, pepper and olive oil. Roast in 400ºF for 30-45 minutes until the flesh is tender. Great alone or added to soups and risotto. 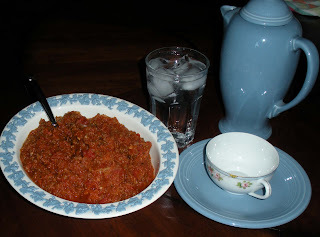 Kids never know the difference when we use spaghetti squash as spaghetti try my recipe below. • Halve, remove seeds, put put small puncture marks on the outside skin and poke a fork into the inside meat and sprinkle with canola oil and lightly press brown sugar onto inside of squash and all along the rim, place down on pan and turn slightly to form a seal. Roast in 400ºF for 45 minutes or until the flesh is tender. Sprinkle with more brown sugar to taste and mash together. 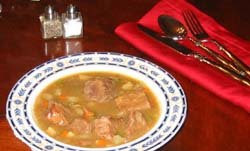 • Boiling – Peel and cut into bite-sized chunks and cook for 7-9 minutes in boiling water. Wonderful when added to stews, doesn’t work as well with spaghetti squash. • Microwave – Depending on the squash: Approximately 5-6 minutes per pound for spaghetti squash, 8-10 minutes for acorn squash and 5-10 minutes for butternut squash depending on size. Make sure to puncture skin 4-5 times before putting in microwave. fork to scrape the inside of the spaghetti squash. Clean and soak seeds in salt water solution for 1 hour. Sprinkle lightly with Kosher salt and bake for 1 hour. Not only do sweet potatoes possess a sweet flavor, but they're also one of the most nutritious vegetables out there. Sweet potatoes are an excellent source of vitamin A and vitamin C and a good source of vitamin B-6, fiber, copper and potassium. When looking for the best sweet potatoes, find firm, medium-sized potatoes with tapered ends. Avoid ones with blemishes, sprouts or any sign of decay. Sweet potatoes will keep for several weeks when stored outside the refrigerator in a cool, dark and dry place (try a brown paper bag). Scrub well before using. Roasting – Put in oven unpeeled at 350ºF for 45 minutes to 1 hour. Things to try with sweet potatoes: cinnamon, ginger, nutmeg, rosemary or brown sugar. 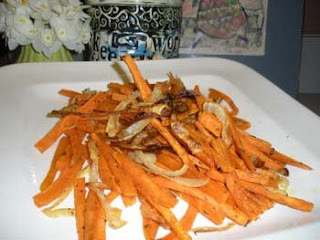 For another way to roast sweet potatoes see my recipe below for sweet potato fries! My sister Claire shared it with me - it is a family favorite! 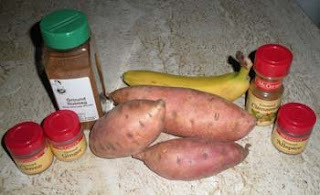 Boiling – Peel sweet potatoes, cut in half, place in a pot with cold water, and bring to a boil. Boil about 30 to 40 minutes, depending on size; drain and mash. Parsnips are an excellent source of vitamin C and folate. The best parsnips are well-shaped and small with firm roots. Large, older parsnips require more peeling and have a woody core. If refrigerated, parsnips will keep for a week or more. Add to stews - Cut parsnips into cubes and use them in soups or stews. If you look at my beef stew recipe in the blog titled “Avoid Dinner Dread” you will see parsnip used, it adds a nice sweet taste to the recipe. Roasting - Parsnip is great roasted with a variety of other fall vegetables. Roast for 20-40 minutes (depending on the size) at 375ºF. Boiled – Boil for 10-20 minutes and then chill to enhance flavor. Mash and mix with mashed potatoes for a sweeter, richer taste. The recipes for this post are using two of the three vegetables we talked about, Spaghetti Squash Spaghetti and Sweet Potato Fries, I make the fries just to snack on, it is a great treat filled with nutrients, enjoy! Brown ground beef and onion in stock pot over medium high heat, season with Kosher salt and ground black pepper. Once meat browned, reduce heat to low and cook covered for 30 minutes, stirring occasionally. Add tomato paste, water and diced tomatoes. Continue cooking on low covered for at least 1 hour or until ready to serve, stirring occasionally. See above for directions for cooking spaghetti squash. Place sweet potato, onion and rosemary in a ziplock bag and add extra-virgin olive oil to cover. Mix ingredients in bag until fully coated. Spread ingredients in a single layer on a cookie sheet and bake for 30-45 minutes. Do not pour oil from bag onto baking sheet, only use oil to coat. Turn fries after 15 minutes and check every few minutes after first 30 minutes. These fries won’t be crispy, but gooey and ever so tasty! Enjoy! Still looking for a gluten-free soft bread or hamburger buns? Well, I have a treat for you… In Evanston, Illinois you will find Rose’s Bakery – a dedicated gluten-free bakery that makes fresh breads, cookies, cakes, pizzas, pies and assorted pastries. Who said you can’t enjoy bakery goods with food allergies? Rose also has products that are dairy-free, egg-free, peanut-free and are made with Agave nectar. Need a special cake customized for your allergies? Rose’s can do it for you (with 48 hour notice). Not only does owner Rose O’Carrol suffer from celiac disease, her mother, her sister and three children are all either celiac or gluten intolerant. I sat down with Rose and got some more details about her products. Q: What is the most common allergy of your customers? We have several products that are dairy-free as we realize about 70% of the gluten sensitive population are also sensitive to casein. Q: What is your favorite treat? The almond bar, but as for cookies Rose’s favorite changes every week as the cookies offered change weekly. Q: What do you do to ensure no cross-contamination in your store? We are a gluten-free, peanut-free and corn syrup free facility. We are very aware of allergies and cross-contamination potentials. If you are allergic to soy, dairy, nuts or any other food group, please let us know your special needs when you place your order. Note: While we are peanut-free, we do have tree nuts in this facility. Those who are severely reactive to tree nuts or other potential airborne allergens should avoid our foods. Q. How long do your products last once, we get them home? These products last similar to bakery goods cooked with wheat flour. If you freeze your products, they can last up to a month. Q. How many tries does it take to perfect your recipes? Rose is continually testing recipes, the basic flour mix she uses in her baked good uses 5-10 different kinds of flour! Q. Any new products on the horizon? Now that the weather is getting cooler, Rose is planning on selling and shipping her bread cookies and brownies on-line starting in November. Visit www.rosesbakery.com for more information. Rose’s Bakery also has a café, if you have time for lunch or dinner. 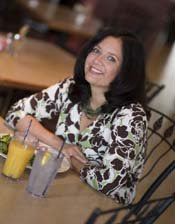 Her menu emphasizes organic vegetables, hormone-free, anti-biotic-free organic meats. 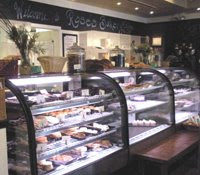 Rose’s Bakery was recently certified as a Gluten-Free Store. 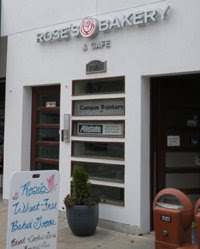 It is so exciting to find a gem like Rose’s Bakery, you have to try the dairy-free French rolls, my personal favorite! Rose's Bakery is located at 2901 Central Street, Evanston, Illinois 60201. t-847.859.2723. I just had to take home some French rolls from Roses for my hamburgers and roasted potatoes, Enjoy! Form into patties and press concave divot in patty so it will stay flat when cooked (makes stacking condiments easier). 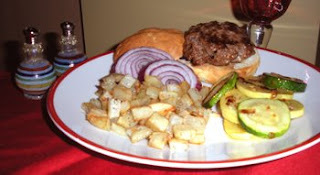 Cook patties in large sauté pan on medium high heat 5-7 minutes per side. Blend garlic, black pepper, rosemary leaves, oregano and Kosher salt and put aside. In a large skillet over medium high heat, add canola oil and brown potatoes. Transfer potatoes to a baking sheet, sprinkle with herbs, olive oil (if needed) and lemon juice. Next blog: Take advantage of fall vegetables while they are here! When I was first diagnosed with food allergies, I rarely ate out, and when I did go to restaurants, I would just wait to come home to eat. This would be extremely difficult if I was gone all day. It was easy to avoid foods that I shouldn't eat when I stayed home, but that wasn't practical, so I ventured into my first restaurant to eat "post allergies". Have you ever seen the movie, "When Harry Met Sally", the scene in the restaurant where Sally drives the waitress and Harry crazy with all her questions and requests? Ask questions about everything! It may seem uncomfortable at first, but it is your health and you are worth it. What oil do you use to cook your foods? Are your fries coated with anything? Can you cook my eggs with canola oil instead of butter? Can I substitute the cheese on my burger for some advocado? Whatever applies to your allergies - you are paying for the food and are entitled to stay safe. Once I figured out how to stay safe in restaurants I haven’t looked back since, I love to go out to eat and rarely have issues. 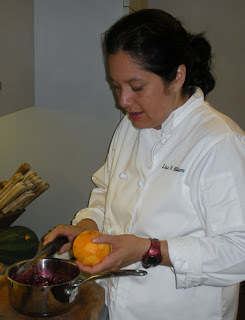 Look for my next blog - Lisa Shops Allergen Free at Rose's Bakery. Visit Chicagoland area restaurants, bakeries and grocery stores with me. Good news for non-Chicagoans, some of these places will ship! Who doesn't love ribs? These ribs fall off the bone and are so tender. Lightly rub Kosher salt, ground black pepper and garlic powder on ribs. Very lightly baste with BBQ sauce. Place ribs in roasting pan and add water until half full. Tightly seal pan with aluminum foil. Bake for 2 ½ hours or until desired tenderness. Increase oven temperature to 275°F. Remove foil and excess liquid from pan. 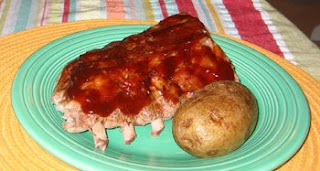 Baste with a thick coat of barbecue sauce. Place back in 275°F oven, uncovered, for 20 minutes. If you are cooking these with the ribs, you can cook for 1½ hours at 250°F. Pour extra-virgin olive oil into a plastic bag. Measure the garlic powder and ground black pepper onto a plate, and stir around a little. Coat each potato with extra-virgin olive oil by placing in the bag, and moving it around. Remove from the bag, and dip into the seasoning. Rub seasoning into the potato to coat. Place the potatoes directly on the oven rack. Bake for 1 hour in the preheated oven, or until the potatoes feel soft when you squeeze them. Once I had established a few meals I knew were safe, my husband and I ate a meal rotation of 3-4 meals and it got quite boring after a few weeks. Now is the time to be creative, and open to try things you might not have thought of before. I never would have eaten salads with fruit in it before, but now it’s one of my favorite meals. You’ll find that your tastes change with this new way of eating, and it’s a good idea to give foods you might not have liked before another try. It is so important to play with different foods and see what you like now since we are limited in our choices. But there are so many interesting, delicious foods out there, it can be a great adventure. 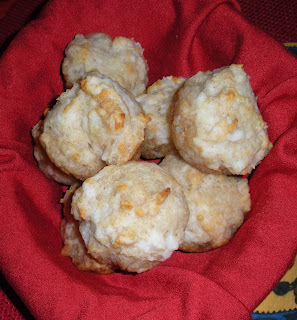 My great grandmother used to make the best beef stew with fresh biscuits and as the weather turns colder, I thought time to make it allergen-free. I am still working on the biscuit part, but cut up toasted allergen-free bread of your choice works nicely for now. Roll chuck in seasoned flour (see below). In a sauté pan over medium-high heat, add extra-virgin olive oil and brown chuck thoroughly. Simmer 2 hours, adding water if necessary. Add remaining ingredients and cook 30 minutes or until vegetables are tender. This dish is better the next day if you can wait! Mix together and store in air-tight container in cool dry place. When I was first diagnosed with allergies, I wanted so desperately to find substitutions for the foods I loved; and with great effort and time I kept trying to recreate favorites like pizza, lasagna, cakes and cookies with just minimal success. There are products out there for pizza; however, the difference in taste from what I knew was so vast that I decided it was better to do without. Of course making food substitutions will be different for everyone; but the point is some things just don’t translate that don’t include the allergens we can’t eat. With that said, it is important to keep trying, maybe you won’t make the best gluten, wheat, and dairy-free pizza, but instead you might invent a new recipe you absolutely love that is something else altogether. This is a marathon, not a sprint, so enjoy the ride, but don’t get too frustrated if you can’t have everything you once did. Your well being depends on your new choices. These baked beans are delicious and easy to make, I use my crock pot so there is little to do once you have it in the pot. Drain and cover with cold water in 5-quart stock pot. Bring beans to a boil and reduce heat and simmer for 45 minutes. Mix other ingredients and add with beans in crock pot, cook on high for one hour. Reduce heat to low and cook for 6-8 hours. 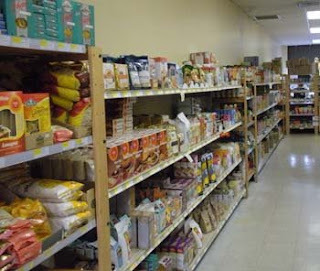 · Extreme Specialty Stores– These stores have great selections of allergen-free products, if you are looking for that great bread you can find some really great mixes in these stores. And if you like a product that you can’t find in your local store, ask your grocer to stock it, often they will. If we all start asking for the foodstuffs we want, our choices, selections, and shopping will start to change for the better. This recipe is one of my favorites, the pan juices make the chicken so tender and juicy. Sometimes if I don't have a whole chicken, I use thighs or whatever I have as long as it has the bone. Partially boil potatoes, cut in quarters and set aside. Lightly season chicken with Kosher salt and ground black pepper. To a heavy skillet over medium-high heat, add 3 tablespoons extra-virgin olive oil, garlic and chicken skin side down. Brown first side (about 5-7 minutes and flip). Add white wine, chicken stock, garlic powder, Kosher salt, oregano, ground black pepper and Italian flat leaf parsley. Remove chicken from heat and add quartered potatoes. 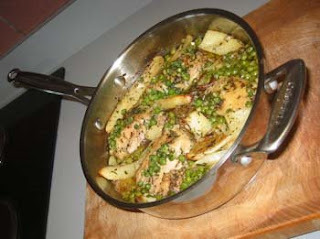 Place chicken in oven for 15 minutes, baste and add frozen peas. Cook another 45 minutes or until thigh is internal temperature of 180°F. When I first was diagnosed with food allergies, I went home, I went to the kitchen, opened the door and critically surveyed our fridge. I quickly realized there was little there I could eat. 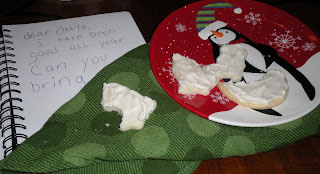 Bread – gone; cheese – gone; milk – gone; sugar - gone. I had no idea that my allergens are ingredients for many products that you wouldn’t think contained them. Canned tomato soup has gluten, rice mixes have dairy; I really needed to empty my pantry and start all over. My first visit to the grocery store was equally shocking, I thought I could easily find and substitute other brands of products that I loved but realized that most of the center aisles of grocery stores had just become off-limits to me. And so the journey began, reading each and every label to make sure there were no ingredients that contained allergens. The bad news, and to make matters worse, you couldn’t just do it once and know that food was safe, you had to do it EVERY TIME to make sure the manufacturer hadn’t changed the way the way the product was produced. The good news is once you have gone thru this process a few times you know how to navigate around the grocery store to find just what you need. It is kind of fun to scan the shelves for new products because the market for these types of products is growing very rapidly, and the selection of products keeps increasing. Don’t fall into the trap of getting the same thing each time, I just found the best banana bread my husband and I could eat and hardly know the difference. My great grandmother made this for us when the weather turned cool. The recipe calls for canned beans, I prefer to start with dried beans, but either way the recipe has got me nothing but raves, so enjoy! Enough to feed an army! Party food you can share. Put tomatoes and pinto beans in large stock pot and put aside. In sauté pan on medium-high heat, add extra-virgin olive oil and sauté green peppers, onions, garlic and Italian flat leaf parsley (this may require you to break up into several pans, adding too much to one pan will steam the vegetables instead of sautéing). Add to stock pot. In another sauté pan on medium-high heat, sauté ground chuck and pork (you may have to use multiple pans). Add chili powder, Kosher salt, ground black pepper and ground cumin to meat and stir thoroughly. Add meat to stock pot, stir well and simmer 1½ hours. When I was diagnosed with allergies to wheat and dairy and sensitivities to sugar and gluten just over a year ago, I discovered I needed to change my shopping, eating and cooking habits overnight. 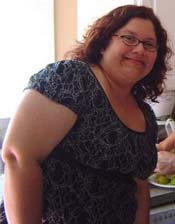 Weighing 250 pounds, exhausted and with near-debilitating health problems when the allergens were finally identified, I began my search for advice and recipes. Finding little practical and specific information, I started looking at my great-grandmother's hand-written recipes and thought, "I CAN have satisfying meals and live well with food allergies. Allergen-free and symptom-free eight months later, I now weighs 175 pounds, work out, run, am strong and healthy. I have successfully built a delicious life around my allergen challenges and now wants to pass along my recipes, food tips, and insight with others. Enjoy the recipes I modified from the loving meals my great-grandmother prepared to be safe for you family. I was raised by my great grandmother and her skills in the kitchen were known throughout the town of Willow Springs, Illinois. 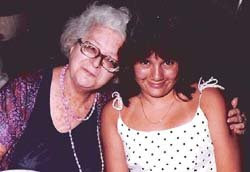 She was known as "Grandma Doogan" even to people with no relation. Every year, the Doogan family had a reunion and one of the recipes I looked forward to her making was her Italian potato salad. It is mayo free, so it is ideal for picnics or pot-luck dinners. Boil whole potatoes with skin in large stock pot over medium-high heat until tender. When done cut potatoes into 1-inch cubes. 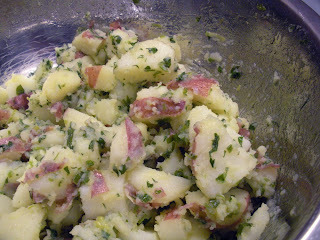 Sprinkle Italian flat leaf parsley and green onions over potatoes. Mix remaining ingredients in a mixing bowl and strain to remove garlic pieces. Pour over potatoes and stir well, continue to stir once every hour.Let dish stand all day (no less than 4 hours), do not refrigerate.